Evolution Tungsten Football Jigs are built from the ground up to be the best jig you have ever fished, period! Made of 97% tungsten, for the ultimate in deep structure sensitivity and detecting light bites. These jigs are 40% smaller than their equivalent weight lead counterpart, which means the fish’s mouth doesn’t have to open as much to pass the head of the jig and medium stiffness weed guard on hook set. This insures a consistently solid set in the roof of the mouth, with maximum penetration of a 4/0 Mustad Ultra Point hook. 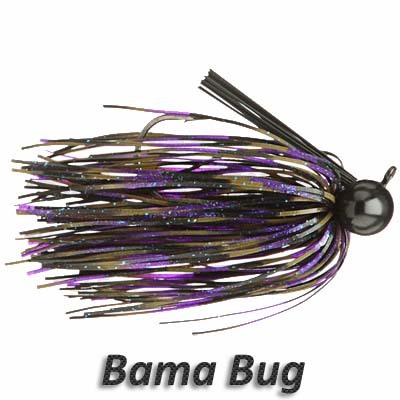 Additionally, due to the smaller size, these jigs hang up less in rocks and crevices. A full 66-strand Living Image 100% silicone skirt is hand tied for extra bulk and flare. No need to replace skirts, slide them up after fish catches, or worry about strands falling out. We take the extra time to hand tie every product we make because we believe it is just flat out better than a flimsy rubber band. A super tough black powder coating is used to keep your jig looking fresh, and the flat eye line tie keeps the jig standing up to tantalize those big deep water bass with your trailer of choice.